Admiralty is the place where the city has its docks and shipyards, and stores of naval property, armament and stocks. In 1704, Peter the Great founded it as the Admiralty shipyards. In November 1705, an earthen fortress was built on the site of the future Admiralty. Then it was repeated­ly reconstructed. In 1738, the main building was rebuilt according to the design of the architect Ivan Korobov. The tower was raised and crowned with a gilded spire. The Admiralty was reconstructed three times. The present building was constructed after the design of the architect Andreyan Zakharov. It took 17 years from 1806 to 1823 to construct the modern building of the Admiralty. 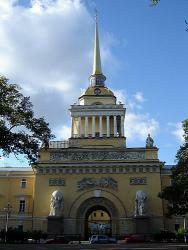 The building of the Admiralty symbolizes Russia’s access to sea. The main facade is 407 metres wide. It is decorated with six multi-column porticoes. In the centre of the facade there is a tower with an entrance arch. The tow­er is adorned by a colonnade and crowned with a cupo­la and a gilded spire. The tower is 72,5 metres high. The gilded spire carries a weathervane in the shape of a ship. This ship is one of the symbols of St Petersburg. In good weather this ship can be seen far away from the building. The building is decorated with 56 large sculp­tures, 11 bas-reliefs and 350 moulded ornamentations. The sculptures of the facade are based on a common foundation. Sculptures are dedicated to the glory of the Russian Navy. On both sides of the arch there are nymphs carrying the terrestrial and celestial spheres. The authors of the sculptures are Ivan Terebenev, Feodosy Schedrin, Stepan Pimenov and Vasily Demut-Malinovsky. Two Geniuses of Glory are above the arch. Over them there is a bas-relief “The Beginning of the Fleet in Russia”. This bas-relief depicts the god of the sea, Nep­tune, handing over his trident to Peter I. The trident is the symbol of his power over the sea. Next to the tsar stands the goddess of wisdom, Minerva. She is appeal­ing to Russia, a young woman sitting under a bay-tree. Russia is resting on the club of Hercules. It is the sym­bol of strength. Russia holds the horn of plenty which is touched by the god of commerce, Mercury. Mercury is standing on bales of goods. Above this high relief at the corners of the lower tier of the tower stand the sculptures of military leaders and ancient heroes. They are Alexander of Macedonia, Pyrrhus, Achilles and Ajax. The colonnade circling the base of the spire is deco­rated with 28 statues (corresponding to the number of columns). They are the four elements: Fire, Water, Air and Earth; the four seasons of the year: Winter, Spring, Summer and Autumn; the four winds of different di­rections: South, North, East and West and the mytho­logical patrons of shipbuilding and astronomy, the muse of Astronomy Urania and the patroness of Navigation Isida. Each sculpture is repeated twice. The grandiose building consists of two U-shaped wings. The outer was held by the Chief Naval Department and the inner one by workshops. The adjacent grounds were given to the Naval and Admiralty settle­ments of seamen and working people. At present the Higher Naval Engineers School is situated in the Admi­ralty.